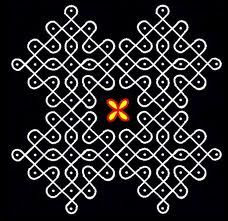 Who haven't heard of the Rangoli or the Kolams of South India? 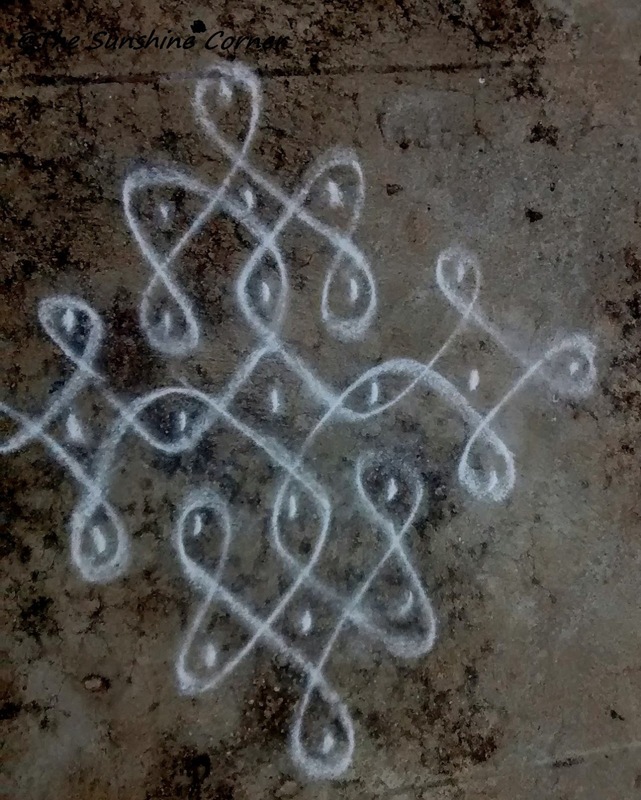 Its a ritual in the morning or in the evening to clean the front part of your house with cow dung and draw rangolis in various shapes with rice powder. This is to welcome the Goddess Lakshmi to home and drive away evil spirits. Nowadays cow dung is reserved only for the festive days that too mostly you would find this practice in the villages. Rangolis exists all over India with different names and avatars. I sincerely admire those people who if not themselves at least with help of maid make a point to draw rangolis daily in South India. 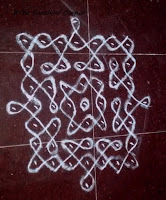 Today I am posting not the colorful rangolis but sikku kolams or neli kolams. 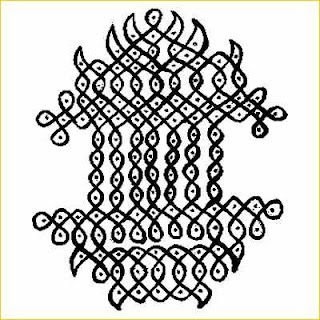 Sikku means knots in Tamil. The difference between the ordinary rangoli and sikku kolams is that we draw patterns on or using the dots in the rangoli but in sikku kolam we draw around the dots(The dots are clearly visible). Hence they are mostly in curved lines. 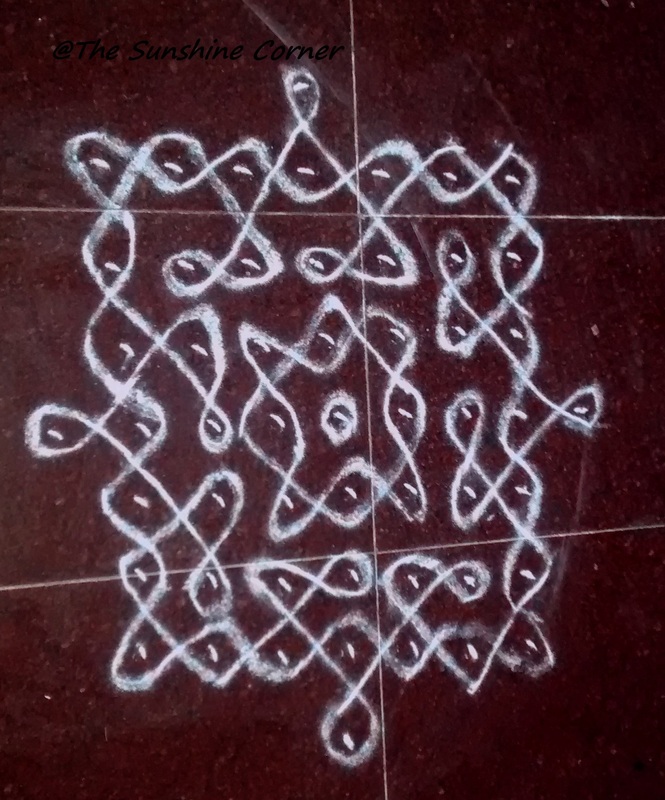 These kind of rangolis are usually uncolored, and it's difficult to find the start or the end of it. 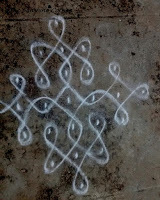 They range from simple ones to most complicated ones, easy to get lost while drawing these rangolis. If you don't believe me, try one for yourself. 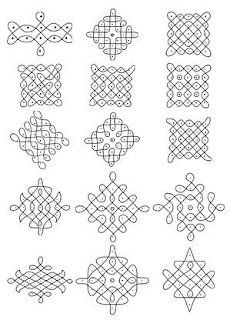 Like any rangolis these are drawn using the rice powder or white rangoli powder. Is it possible to incorporate these into your décor? Yes, I think it's possible in many ways. 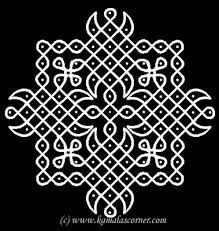 We can paint these pattern on a wall, or do a complex one, frame it well and display it. It's easy to get mesmerized in their beauty, and I drew one of designs on an empty cardboard box, initially drawing with pencil and later by tracing with acrylic white paint. I guess it looks decent enough, what do you think about it? Here are few sourced from Pinterest. Aren't they lovely? These are few simple ones which are easy and can be drawn on daily basis. Here a complicated one which looks like a chariot. 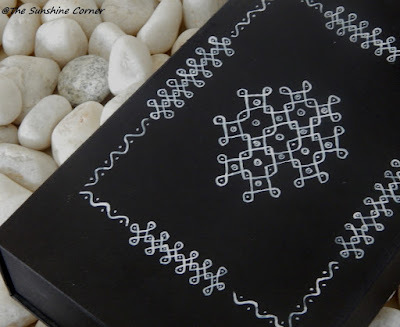 Thank you for introducing this type of 'kolam'. I don't think I have seen this type before though the colourful 'kolam' I see often here have curved outlines. Yup, I think this will make a pretty wall decor as well. Have a wonderful day! Beautiful Kolams...Personally i believe this type of Kolams are hard to draw because i tried to make and ohh god I found it's so tough though you did a wonderful job...Love it!! !